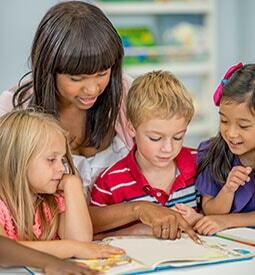 Prepare for a career as a child care professional with online training from Penn Foster Career School. Request information or enroll online The Child Care Professional Career Diploma program helps students prepare for entry-level jobs such as a Teacher Aide, Preschool Aide, In-home Child Care Provider, or Nanny. The program will also provide 38 continuing education units (CEUs) for students working with children ages birth through eight. Family Child Care Specialization — Select this specialization if you’re interested in working in an in-home child care setting as a nanny or self-employed child care worker. Center-Based Specialization — Choose this specialization if you work or plan to work in a child care center or preschool as an aide or assistant. You will have the opportunity to gain practical, hands-on experience in a real-world work environment with two optional Work Experience Options (WEO) that are included as part of your training. Books, study guides, and learning aids. Access to student services by phone, fax, mail, and website. Get more information today, and take your first step towards a new career as a child care professional.